I read the book and was inspired by how important gems and precious stones were in the world. Besides using them for royal adornment, each stone had a different purpose, a different power. 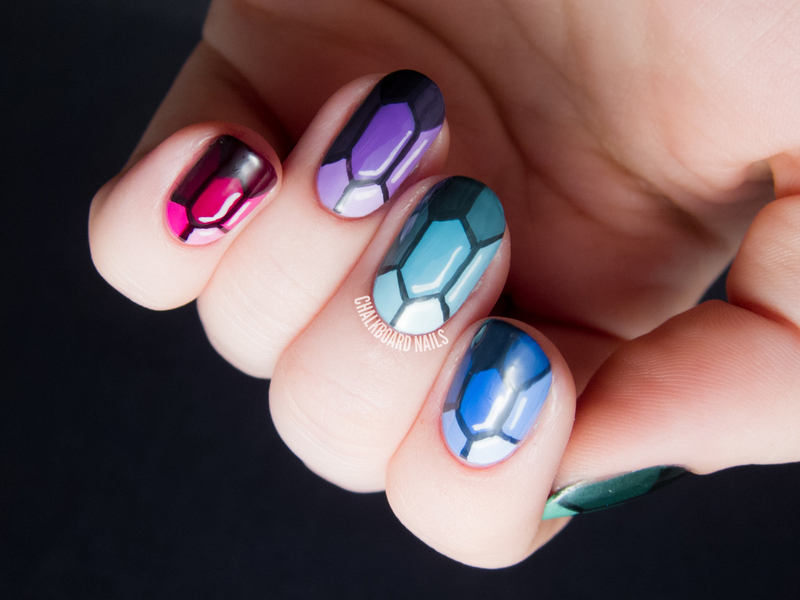 Make each of your nails a different colored gem and invoke the power of them all! Paint your nail with a nail polish in a medium jewel tone. Using a nail art brush or a toothpick and contrasting nail polish, lightly sketch out a oblong hexagon down the length of your nail. 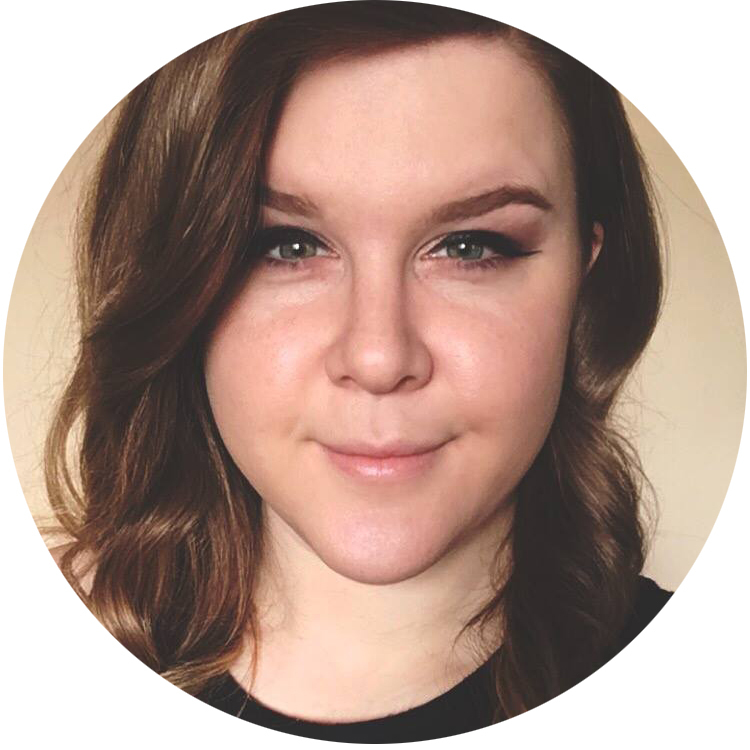 Don't worry about being too precise here, this is just a guide! 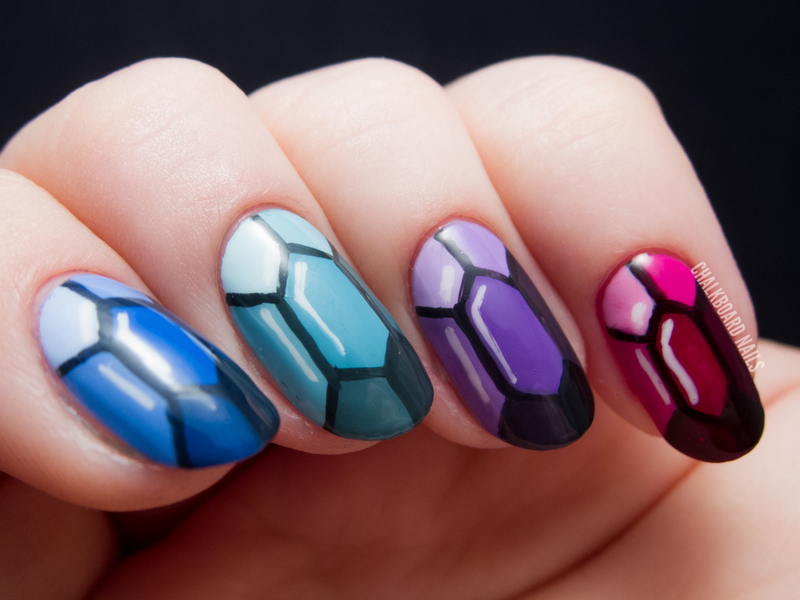 Add facet lines from each point of the hexagon outwards towards the edges of your nail. Working on a piece of tinfoil or wax paper, mix three drops of your base polish with one drop of white nail polish. Fill in the left and top right spaces with your newly mixed shade. Mix one drop of your base polish with three drops of white nail polish. Fill in the top left space with this shade. Mix five drops of your base polish with a tiny drop of black nail polish. Fill in the bottom left and right spaces with this shade. Mix four drops of your base polish with one drop of black nail polish. Fill in the bottom right space with this shade. Using your shade from step seven, outline the facets. If the polish starts to thicken, mix more to avoid lumpiness. Add some highlights to your gem with white nail polish. Finish with topcoat for seal and shine. TIP: If you are having trouble with this design, try using acrylic paint instead of nail polish! It is easier to handle and doesn't dry out as quickly. Just be sure to put down a coat of nail polish first and finish the design with topcoat. Whether you are going to the ball of the season or you just have a date with a good book, I hope that this bold and fun nail art will make you feel extra special. 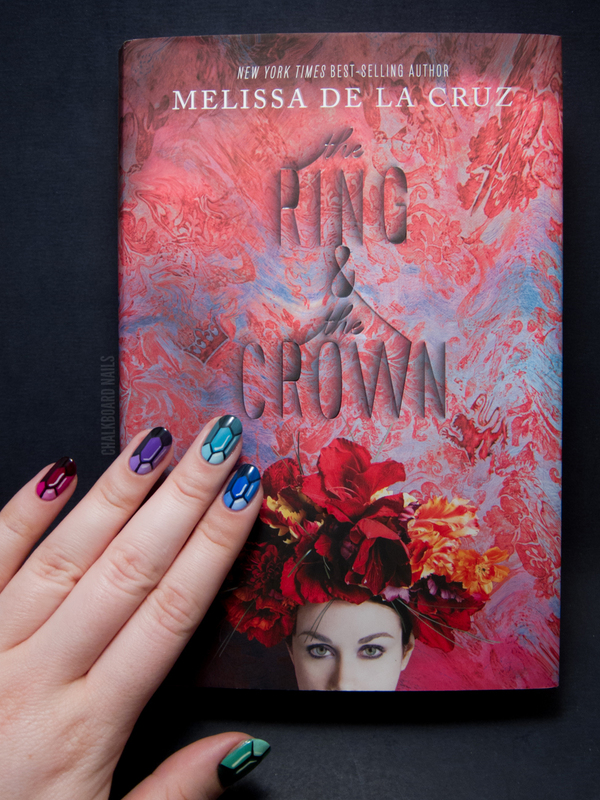 The Ring and The Crown is available now. Visit the official website for more information. This post is sponsored by The Ring and The Crown. All opinions are my own. Thank you! That's funny you say that, my mom said they look like colored turtle shells, too. 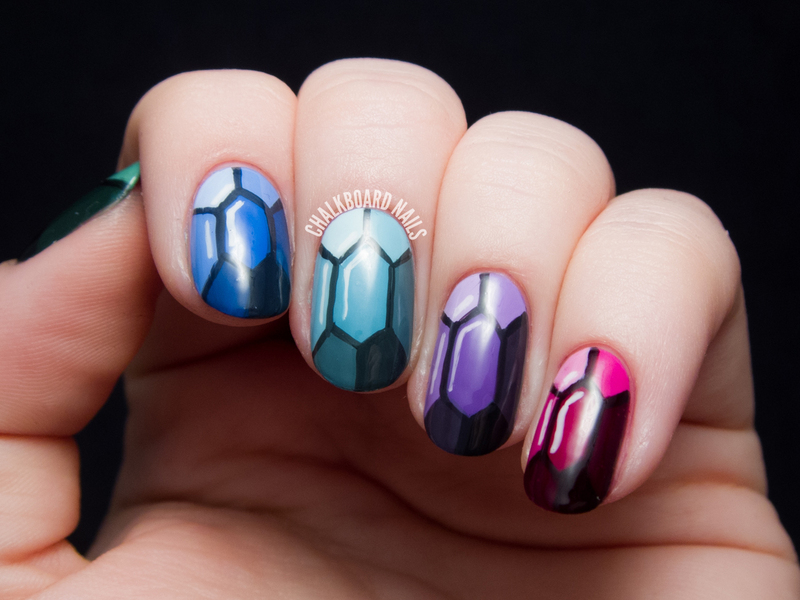 My boyfriend thought they looked like rupees from Zelda. I guess they have many different faces (pun intended...?)! What an awesome design! Amazing tutorial! Love! Love Zelda -- please share your manicure on my wall if you try it! Great! Show me a pic when you do! Super super super gorgeous. Might try this as an accent nail sometime :). Awesome! I'd love to see the end result! I love this mani !! Definitely gonna attempt these tonight! Was going through all my nail art bookmarks looking for some inspiration and as soon as I saw these I fell in love. So beautiful! Just wanted to say you are so freakin' talented!! I'm not normally a huge nail art fan, but yours blows me away every time. Love this mani! these are beautiful! and I really appreciate the tutorial! Going to have to check out that book, I'm a sucker for fantasy. Beautiful! I love this mani! Loving the trailer because that song has been in my head so much lately! <3 Band of Horses. This is so awesome! I love it! You did an amazing job. it's perfect! i totally love it! That is a lovely nail art! I'll probably try to copy it some day! Interesting that TV serie... When would we be able to watch it in my country? Thanks! I thought it was pretty lucky that I had just changed my nail shape, haha. The video is just a trailer for the book, sadly no TV series! You'll have to check out the book if you are interested in the story. Thank you so much! I'm sure yours will turn out great! Thanks! It's a great song -- gets stuck in my head a lot. Did you give them a try? Post a pic on my FB page if you did! I'd love to see. I had a lot of fun reading the book and then drawing inspiration from that... may have to do it more often! Beautiful - I definitely have to try this! How freaking cool. They have a 3D type of effect. Love it. I feel like this design could make some awesome turtle shell nail art too. Teenage Mutant Ninja Turtles perhaps? 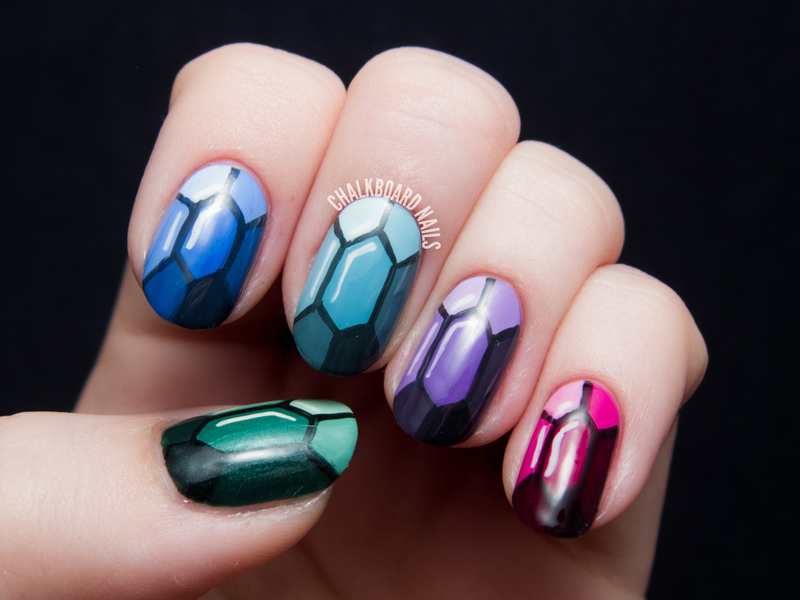 Love the gems nail design. Oh my gosh this is amazing. I can't get Pokemon badges out of my head even though it has nothing to do with this. Loveee it! These remind of me of Legend of Zelda rupees. Awesome tutorial! That was the first thing I thought when I saw them too! Thanks for tutorial I so..... wanted to do it but was not able to figure out how.... This mani is definitely the next I'm doing. Hello, and thank you for this really clear tutorial. Jamie I guess these nails are fashion old designs. Loved your design, and so did my mom. I tried to do it. What do you think? Gorgeous!! !I must try them too!